W Hotels established itself as an innovative luxury lifestyle brand that provides the ultimate in insider access, allowing global jetsetters and local tastemakers to be connected to the pulse of the next big thing. W Hotels has more than 44 hotels and retreats in the most vibrant cities and exotic destinations around the world. 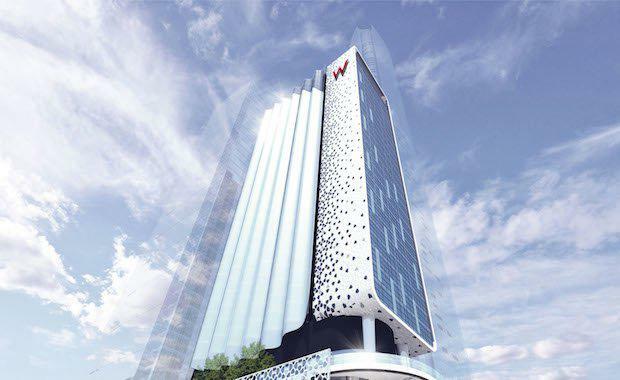 W Brisbane will join Starwood’s 14 properties in Australia, as part of a pipeline of 15 W Hotels set to open in theAsia Pacific region before 2019. “We are excited to be working with Starwood on this prestigious development project and the re-entry of W Hotels, which will bring a new level of luxury and service to Brisbane’s hospitality scene,” said John Lin, Group Director, Shayher Group of Companies. Located on 300 George Street by the Brisbane River, the mixed-use development is a joint venture betweenShayher Group and Pau Jar Group of Taiwan. The development will be comprised of three separate towers - W Brisbane will occupy one tower, while the other two towers will be used for premium office and commercial space and high-end residences. The development will also feature podium level retail outlets. W Brisbane will offer 305 stylish guestrooms, including 25 suites and an Extreme Wow Suite®, the W brand’s reinterpretation of the traditional Presidential Suite. It will also feature more than 960 square metres of ultra-modern meeting and event space, as well as a 24-hour WIREDSM business centre, spa, FITSM state-of-the-art workout facility, WETSM indoor heated swimming pool, and W Hotels The Store. In addition, the hotel will house three unique restaurants and bars, including an all-day dining restaurant, Pool Bar and the W Lounge. Guests can expect the W brand’s iconic Whatever/Whenever® service philosophy, providing them with whatever they want, whenever they want it. “We have been looking for the right location and partner to bring W Hotels back to Australia for some time, and as an emerging and vibrant international city, Brisbane presents the perfect opportunity for the W brand’s re-entry in the market,” adds Andrew Taylor, Director of Acquisitions & Development, Starwood Hotels & Resorts, Pacific Region.